Technology has reached almost every facet of our lives in recent years. It seems that everything from the temperature in your home to flying a drone is controlled by a smartphone app. Even my smoker can be monitored by my smartphone, which I enjoy immensely. Distributors have also benefited by this connected technology. Inventory and fulfillment systems are now entirely connected making the supply chain incredibly efficient. Robots and manufacturing systems talk to each other and production can be monitored from an office many miles away in real time. But what about dust collection systems? Where are the smartphone apps and intranet connections? Is anyone watching real-time charts and graphs on dust collection performance? They are not. At least, not yet. Dust collectors are simple machines. They pull air through filters and exhaust it. Typically, a differential pressure gauge mounted on the side of the collector will show you when you need to change the filters. For this reason, these simple machines have avoided the influx of technology that seems to be included with everything else. As energy usage and efficiency become more and more scrutinized, don’t be surprised to find technology finding its way into the dust collection industry. The efficiency of a dust collection system relates to many factors; CFM, duct loss, transport velocity, static pressure, horse power, filtration (air-to-media ratio) and so on. While providing exactly the right amount of each of these factors is the goal, it is often difficult to be precise. So, engineers and designers build-in a “fudge factor”. This simply means that they overshoot the targets a bit to ensure to reach these targets. Obviously, this can be wasteful. Increasing air means a larger fan which leads to larger horse power and thereby power consumption for example. Using a combination of today’s technologies, systems can be made much more efficient than ever before. One great tool is a variable frequency drive (VFD). The VFD can reduce the speed of a fan saving energy and still providing effective airflow as needed. For example, as the filters load with particulate, the VFD can slowly increase the speed of the fan to compensate for the increase in pressure. This same adjustment can be made between reverse pulse filter cleaning cycles. Maintaining a constant air volume allows the process to have enough ventilation without wasting energy. Wet type dust collectors can also take advantage of the variable frequency drive. Given the ability to adjust the fan speed can greatly increase the efficiency of the scrub. The scrub is the point where water mixes with particulate in the air stream and removes the dust. This scrubbing process can be dialed in to its most efficient operating point with the use of the VFD. In a typical cartridge dust collector that uses a compressed air reverse pulse, filter cleaning system, it is important to pulse the filters clean when they load to ensure that transport velocity in the ductwork doesn’t fall to a crucially slow level – dropping particulate in the ductwork. By utilizing an updated pulse timer/controller with a velocity sensor/transmitter and a modern VFD, such a system can be setup to ensure maximum efficiency while providing safe, and effective operation. Capture velocity at the pickup points and transport velocity in the ductwork can be maintained while using less compressed air and less motor horse power. When a system can monitor velocity, differential pressure at the filters (filter loading), as well as signal/control pulsing systems and motor drive speed in this way, you have a powerful combination. Today, some of these systems have the components necessary to communicate with smartphones and the internet, however, remain unused by the industry. Soon, plant managers and maintenance crews will monitor systems with an immediacy and accuracy never seen before. Efficiency can also relate to the rate of filter media being replaced. Reducing the load on the filter media can increase filter life and reduce the interval between filter replacement. Filter replacements can cost anywhere from $100.00 to thousands of dollars depending on the size of the collector. By increasing the life of the filters dollars will be immediately saved. A drop-out-box is a simple way to increase filter life and is often used to re-claim product. A drop-out-box simply sits in front of the intake of the dust collector. Air entering the box is slowed due to the increase in volume of the airstream. Dust initially encounters a deflector plate that forces particulate down toward the bottom of the box. The slower moving air does not have enough force to return the heavier particulate to the airstream and it falls into a collection bin to be re-claimed. In return, only the lightest particulate enters the dust collector increasing filter life. While there are many different types of dust collectors including down draft benches, booth systems, and ducted systems, it is the ducted systems where you will first see the introduction of technology. In combination with the VFD, the use of a Human Machine Interface (HMI) will be used. 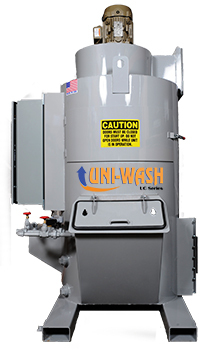 ProVent LLC, in 2019, will introduce the use of a VFD and HMI for their Uni-Wash line of wet dust collectors. The HMI can monitor several inputs of information and responding to different situations. A 10-inch touchscreen will show real-time water level and fan speed, allowing the user to adjust for optimal efficiency. The HMI will also monitor airflow, motor temperature, after-filter temperature and water level. In the future, the information will be used to automatically adjust the fan speed to operate the dust collector at the most efficient fan speed and water level. Once connected to an intranet or internet, the HMI can signal, via app or email, service and maintenance requests based on real-time data instead of a regular maintenance schedule. This will make sure that the equipment is serviced at the optimal time, not before it is needed and not after a problem has been detected. A rise in temperature of the motor or filters can be detected earlier and preventive measures can be taken, possibly preventing a fire in the dust collector and avoiding production interference. While there are no new technological advances in ways to remove dust from an airstream, technology can play a big role in advancing efficiency and lowering the amount of energy it takes to do this work. Technology advancements and the data they provide tend to lead to new ideas and designs that may reveal something the industry hasn’t imagined before. Only time will tell.